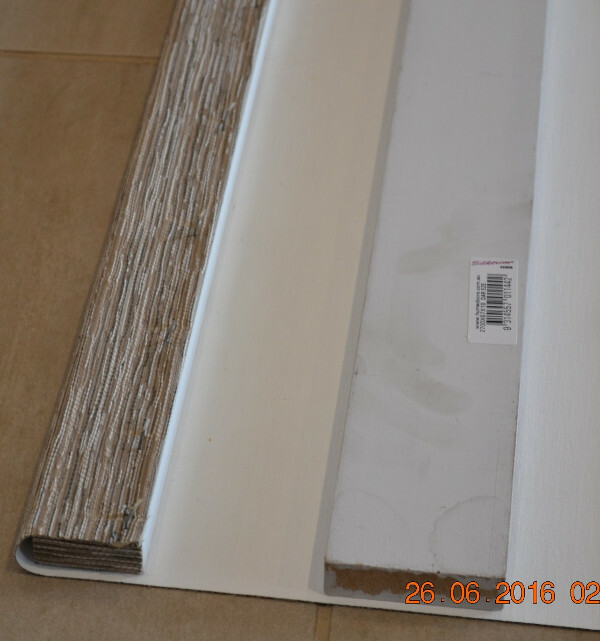 We are often asked about retrofitting Roman Shades (and cellular blinds) with our motors, and recently one of our clients kindly sent us some pictures and an explanation about how he motorized his Roman shades (many thanks Marty!). It is actually relatively easy to do this because essentially you install a motorized tube above the unit, which is used as a 'winch' or 'winder' to pull up the cords that go down to the bottom bar. 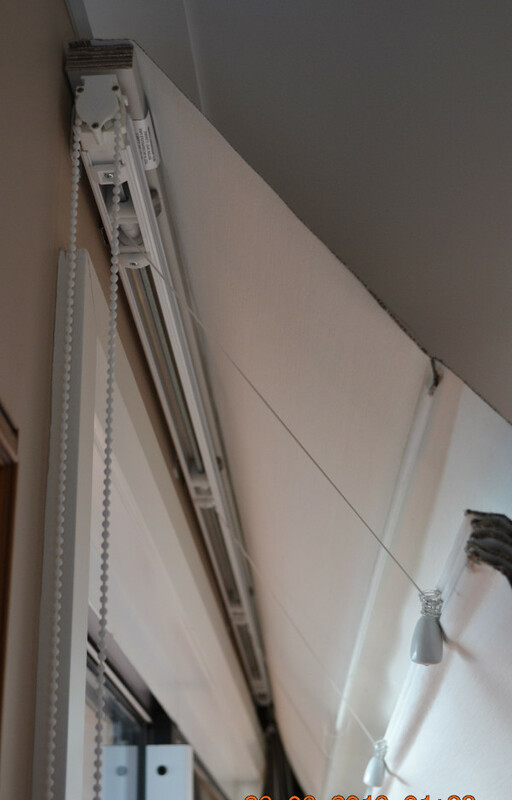 There are different types of Roman shades, but in every case our motors can be used to "winch" up the shades; if you follow the pictures and explanation below, you'll see how Marty in Australia did it. 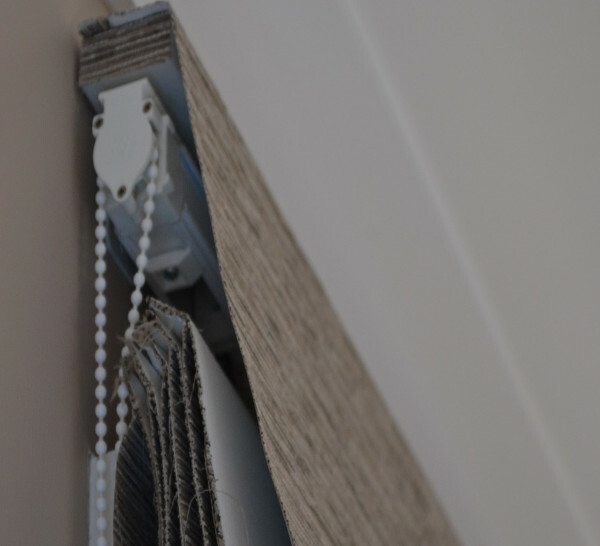 Once you have it operating properly, you can use all our wall mount and hand held remote controls to open and close the shades. 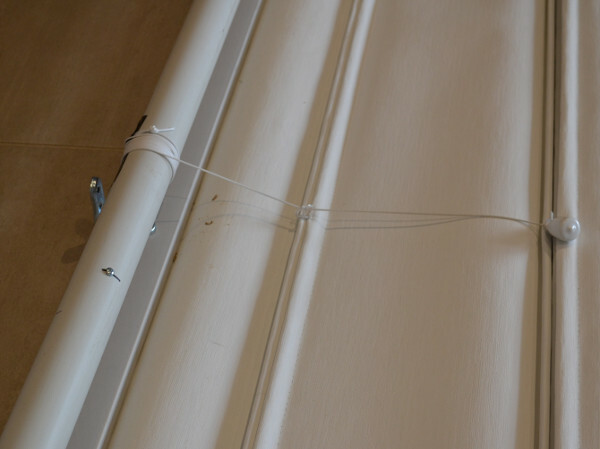 Existing Roman Blind shows chain drive and end of head rail. 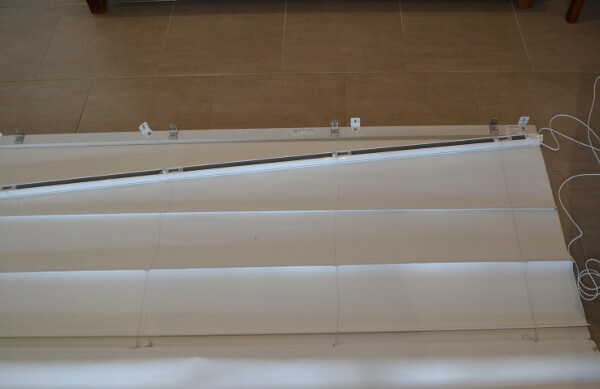 Full length Head Rail needs to be removed and discarded. 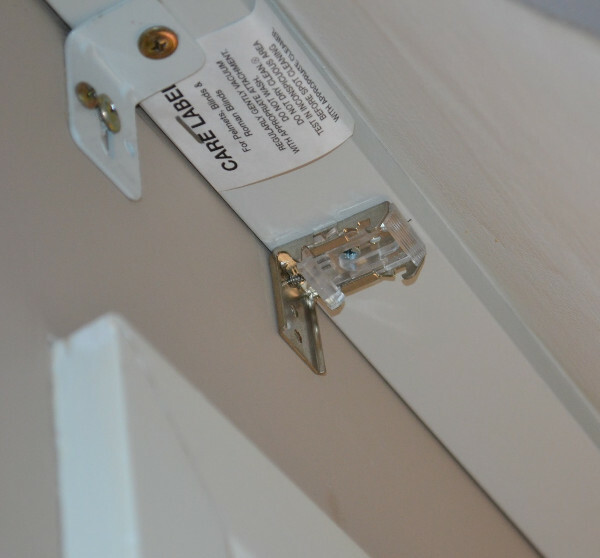 Head Rail easily unclips from brackets attached to "pelmet". 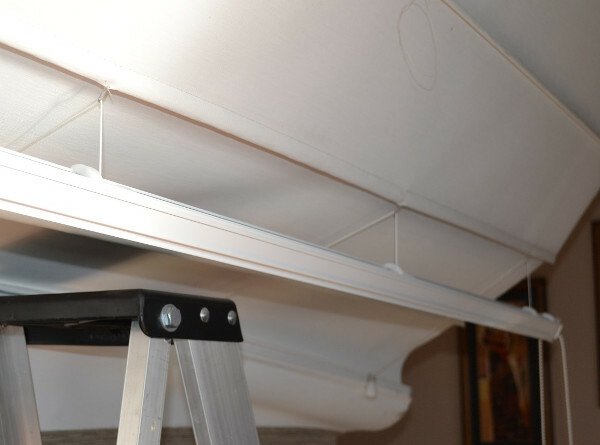 White bracket holds up pelmet. The silver bracket is one of four that held Head Rail in place. Head rail hanging free after being unclipped. 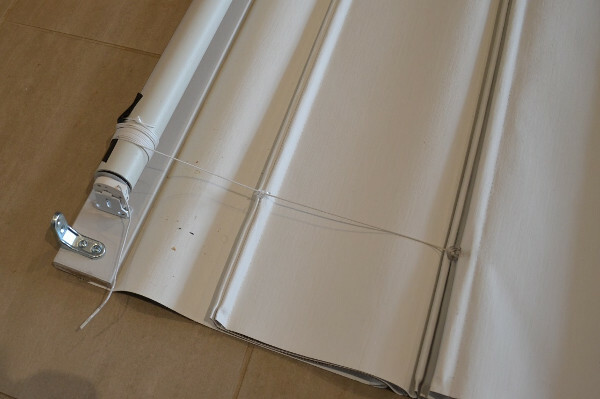 The Roman Blind lying on floor, showing disconnected Head Rail. Four existing cords had to be fully unwound from Header Rail, then cut off. Head Rail was discarded. 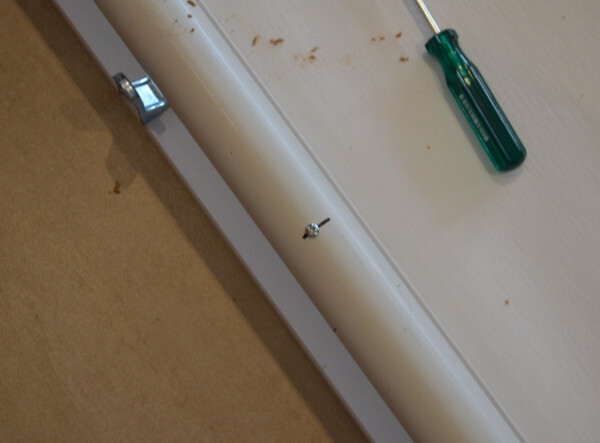 Roman Blind material was glued and stapled to top of pelmet (Left of picture). 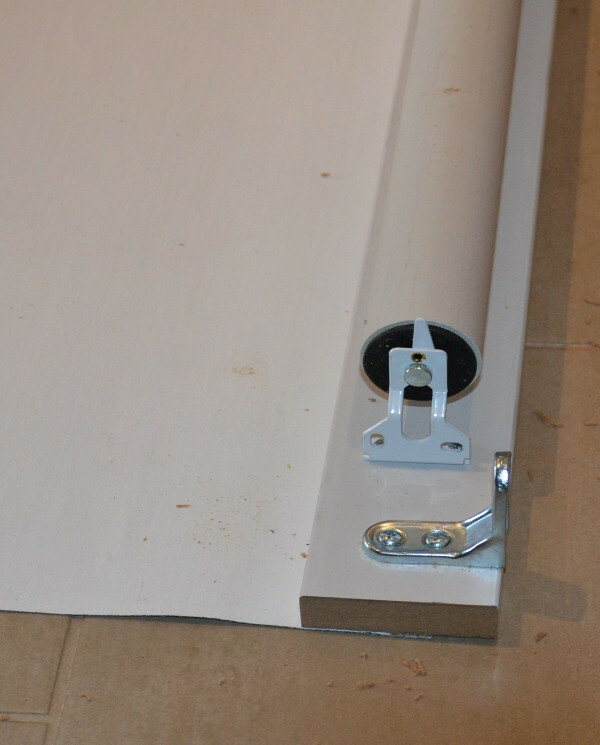 This pelmet board was not wide enough (38mm) to accommodate new brackets. Replaced with wider board (68 mm). New, wider pelmet board attached. Also, used new mounting brackets to carry extra weight. 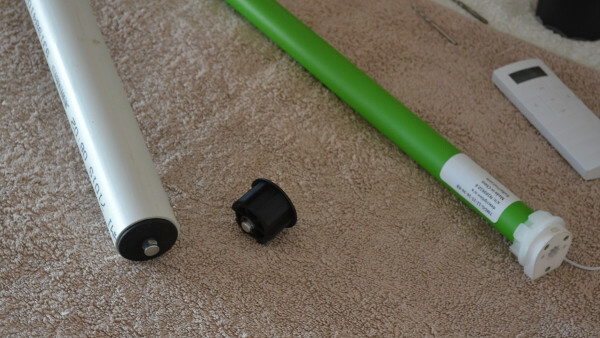 This is the non-motor end of my PVC pipe – 37mm inside diameter. 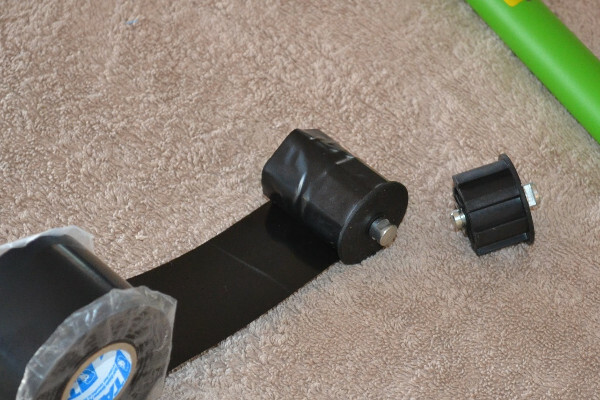 Cog (idler) wrapped with enough tape to make a snug fit is already inserted. Additional cog (for my next blind) shown for comparison. Adding tape to drive cog adapter of motor. 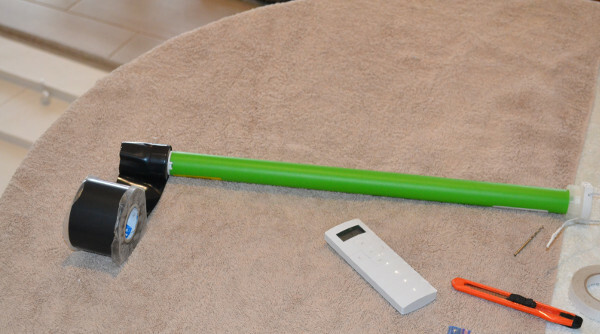 Ready to slide motor into PVC pipe. 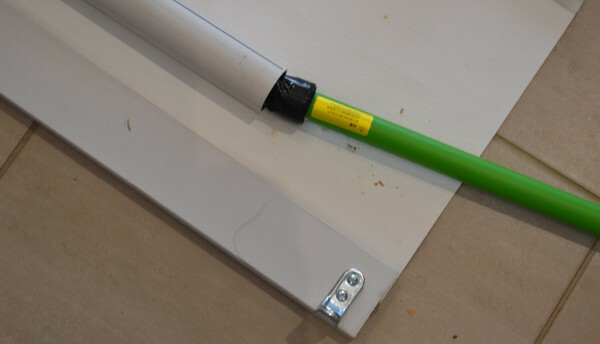 PVC pipe was marked (as suggested by RollerTrol) so that self-tapping screw could be inserted through pipe and into the drive adapter of the motor (locks it to the tube). Other end of PVC pipe, again special bracket from Rollertrol makes it easy to mount the pipe. I drew a black like along the length of the PVC pipe, this to ensure that each of the 4 cords would be accurately attached. The first cord is shown here, simply hooked onto another self-tapping screw. Once all 4 cords were attached I added Duct Tape to make sure cords would not accidentally disconnect. All 4 cords attached. 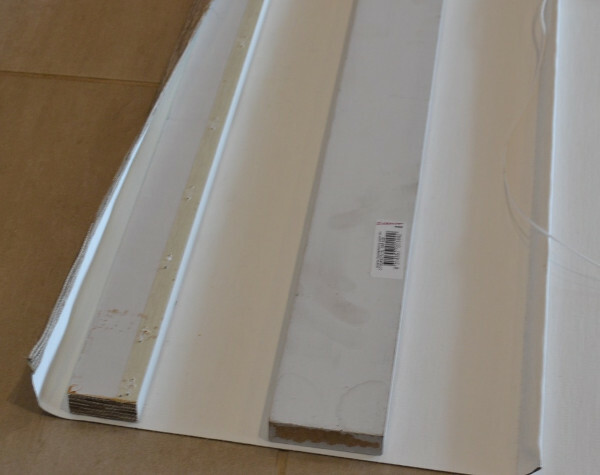 Note, PVC pipe can be shorter than pelmet, as long as all cords can be attached. 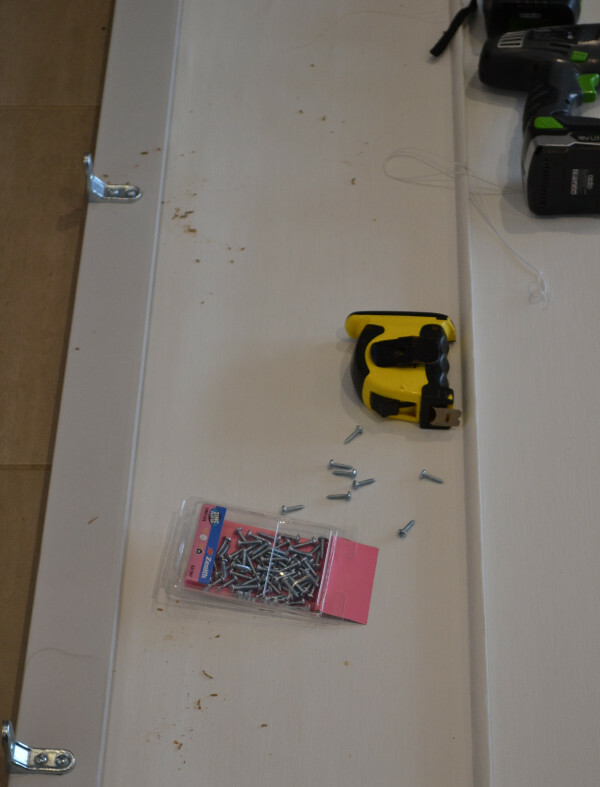 I found this convenient because mountings for pipe did not interfere with pelmet brackets. 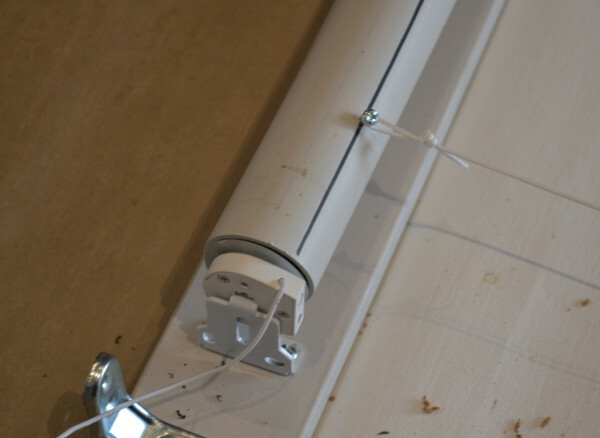 Cords wrap around the PVC pipe roller, thus raising blind. Note black tape under cord, helping to hold cord in place. One of the centre cords rolling onto pipe. Note self-tapping screw helping to lock drive cog (inside pipe), ensuring motor drive does not spin inside the pipe - the motor drive and pipe are locked together, but the motor housing itself is stationary. This blind is 2000 wide by 2100 long so was fairly heavy. The material is called sail cloth. 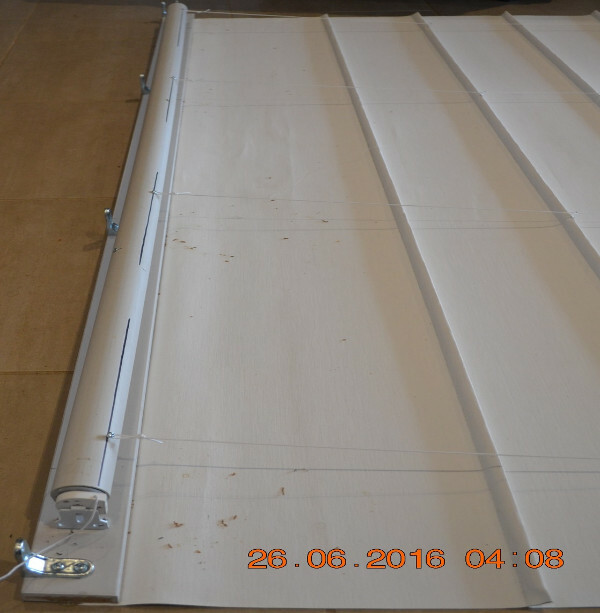 Two people were needed to remount the blind onto the wall above the window. I have now installed a total of 5 units in our living area and all are now working well. We have the excellent BroadLink phone apps that are very capable, and they may very well be all you need for home automation (comes with phone app). This will give you direct control over our blind motors, window openers, smart plugs, security kits, environmental sensors, and many other devices. If you are interested, you can purchase motors for Roman blinds and our control products in our DIY online automation store.